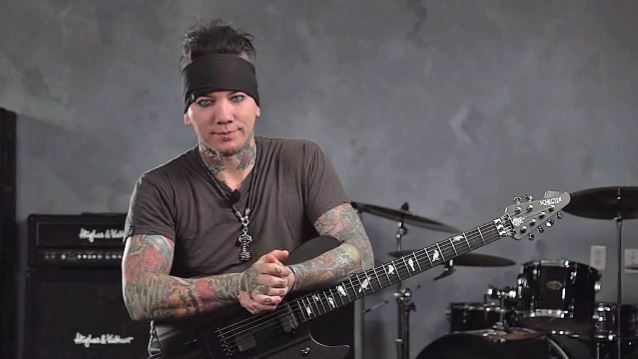 Former GUNS N' ROSES and current SIXX: A.M. guitarist DJ Ashba says that he walked away from GN'R after a six-year stint with the group because he wanted to focus on doing what he "really love[s] to do." Ashba, who joined GUNS N' ROSES in March 2009 following the departure of Robin Finck and stayed in the band until July 2015, told Eddie Trunk for the "Trunk Nation" radio show: "Well, there [were] multiple reasons [why I left GN'R] — a couple that I won't go into — but the biggest reason was I needed to get back to my roots, back to what I really truly believed in, and that was playing songs I helped write with [SIXX:A.M. bandmates] James [Michael] and Nikki [Sixx]. We [SIXX:A.M.] have five albums out [and] we have a ten-year career together. So we did a tour, 'Modern Vintage' tour, where it was, like, nineteen shows, and that tour really changed my life and put my career back into perspective — you know, being out on the stage and connecting with the fanbase." Ashba also once again claimed that he was approached about being part of GN'R's "Not In This Lifetime" tour, but that he declined, citing his desire to pursue SIXX:A.M. full time. "Axl called me and he really wanted me a part of the reunion, and I turned it down," Ashba said. "I felt if Slash is coming back, that's great — that's what the fans want, and I can go off and do what I really wanna do now… And we left [off on good terms]; everything is good. And I couldn't be happier for the fans out there. I'm a fan. Half of the band reunited, which excites me, but at the same time, it's the best of both worlds — I get to do what I really love to do, and that's play in SIXX:A.M."
DJ added that he hasn't been in contact with Axl since his exit from GUNS N' ROSES and hasn't had a chance to see the reunited GUNS N' ROSES on the "Not In This Lifetime" tour. He explained: "My focus has been SIXX:A.M. a hundred percent . We went in and wrote a double album — 'Prayers For The Blessed' and 'Prayers For The Damned' — and we've been on tour ever since. So we've been incredibly busy ourselves." Only Rose, Slash and Duff McKagan from GN'R's "Appetite For Destruction"-era lineup are taking part in the band's current reunion. They are being joined by keyboardist Dizzy Reed, guitarist Richard Fortus and drummer Frank Ferrer. Also appearing with them is second keyboardist Melissa Reese. Ashba previously said that working with GUNS N' ROSES was "the most incredible journey I could have possibly imagined."